Dynabrade Inc. recognizes the importance of safety and health to business success and strives to continuously improve performance and be a leader in safety and health. Dynabrade Inc. is committed to the safety and health of all operators and strive to provide a safe and healthy workplace environment. The following content contains guidelines for safety and health best practices. Do not use Dynabrade® Abrasive Power Tools for anything other than their intended application. For best performance, use a recommended air line filter-regulatorlubricator to always maintain 90 PSIG (6.2 Bar), unless otherwise stated. Pressure should be checked at the tool inlet while the tool is running. Do not expose air tool to inlet pressure above 90 PSIG (6.2 Bar). Always use recommended air hose, fittings and couplers and inspect them for wear and damage and replace when necessary. On regular basis check free speed of power tool with tachometer to ensure proper functionality of tools. A tool with unusual sound and /or vibration must not be operated and must be inspected and repaired. Hand/wrist/arm injury may result from repetitive motion or prolonged exposure to vibration. A preventative maintenance schedule is recommended to insure the proper functionality of power tools. Never lubricate or clean tools with flammable or volatile liquids. 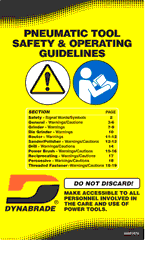 Dynabrade® Power tool labels must be legible at all times. If not, reorder label(s) and replace. To prevent injury, always use eye, face, respiration, hearing and body protection while operating or in areas where abrasive power tools are being operated. Be sure that any loose clothing, hair and all jewelry is properly restrained. Keep hand and clothing away from working end of the power tool. Always work with firm footing, posture and proper lighting. Do not apply excessive force on a tool or apply rough treatment to the tool. Operate power tools with attention to the consistency of the work environment and the tool itself. Follow safety procedures posted in work area. Make sure that the work area is uncluttered, and visitors are at a safe range from the tools and debris. Use a vise or clamping device to hold work piece firmly in place. Electric Machines – Make sure proper electrical codes are followed, including safe wiring and proper grounding. Tool RPM must never exceed accessory RPM rating. Check accessory manufacturer for details on maximum operating speed or special mounting instructions. Always disconnect power before changing accessories or making machine adjustments and repairs. The aluminum Dynaswivel® air line connector or similar accessories must never be used on percussion tools such as chippers and rammers. Do not use damaged, bent or severely worn accessories. When using any tool with an abrasive product, follow all safety guidelines of abrasive manufacturers. Every person involved in operating, repairing and/or supervising grinding machines or wheels should be familiar with the contents of ANSI B7.1. Never mount non-reinforced grinding wheels on any Dynabrade tool. If the speed is higher than the RPM marked on the tool, the tool must be serviced to correct the cause of the over speed condition before use. Always use required wheel guards. Never remove a wheel guard that has been specified for the machine. Damaged, bent and severely worn guards must be replaced. Improper mounting of grinding wheels is one major cause of grinding wheel failure. Each type of grinding wheel requires a different mounting method, spindle diameter and flange dimension. In every case, the Safety Code (ANSI B7.1) should be consulted for proper handling, storage, inspection and mounting information. All grinding wheels and mounting accessories should be closely inspected before installation and use. Protect accessories from exposure to water, solvents, high humidity, freezing temperatures and extreme temperature changes. Store accessories in protective racks or compartments to prevent damage. When using a new grinding wheel, or one that has been out of service for an extended period of time, the operator should start the machine under a steel workbench with proper wheel guard in place. It should be run for at least one minute. If the wheel is defective or improperly mounted, this is the time it will usually fail. Proper machine maintenance procedures are one of the most important aspects of safety in the use of abrasive wheels. Particular attention should be placed to those components or parts which can effect the speed (RPM) of a tool, such as governors on air grinders. Machine specifications are believed to be accurate at time of printing. However, due to design changes, exact specifications of current tools may vary from the listed data.It is our policy to test and measure our tools in a ready-to-use condition and to state the test results in industry-accepted terms. Dynabrade measures typical production tools using the recommended air hose size, 90 PSIG air line pressure measured at tool inlet, and all muffling and speed control mechanisms. Compromises to these real-use operating conditions can artificially enhance performance measurements. HOSE SIZE denotes the recommended inside diameter of the air hose that should be used with the tool for maximum peformance. WEIGHT includes all the parts required to run the tool except the airline, abrasive, or attachment. RPM is measured under no-load conditions. HORSEPOWER is an averaged maximum rating of production tools under ready-to-use conditions. Maximum air flow is measured in STANDARD CUBIC FEET PER MINUTE (SCFM) and is an averaged maximum rating, recorded at free speed on non-governed tools or at maximum horsepower on governed tools. Dynabrade adheres to this standard of measurement. It is usually sufficient to directly compare the SCFM of the tool with the compressor's inlet CFM rating to determine how many tools a particular compressor will run. Depending upon the duty cycle of the tools, a compressor with a storage tank may allow it to run tools with a larger consumption than it's output. SOUND LEVEL is the sound pressure measurement according to the method outlined in ISO regulation ISO-15744. The Term "Ergonomics" can be Defined as the Study of Work. Ergonomics helps adapt the job to the person, rather than forcing the person to fit the job. Adapting the job to fit the worker can help reduce ergonomic stress and eliminate many potential ergonomic disorders. The objective of ergonomics is to adapt the job and workplace to the worker by designing tasks, work stations, tools and equipment that are within the worker's physical capabilities and limitations.